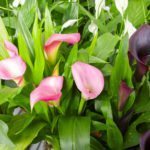 Why do the white flowers on my Calla Lily turn green after a few weeks? There's no need to worry about the green color. These flowers do that as they mature and begin producing seeds. You can cut them off or leave them be.